The Children’s Development Center (CDC) is a private, non-public, specialized school recognized by the State of Illinois. 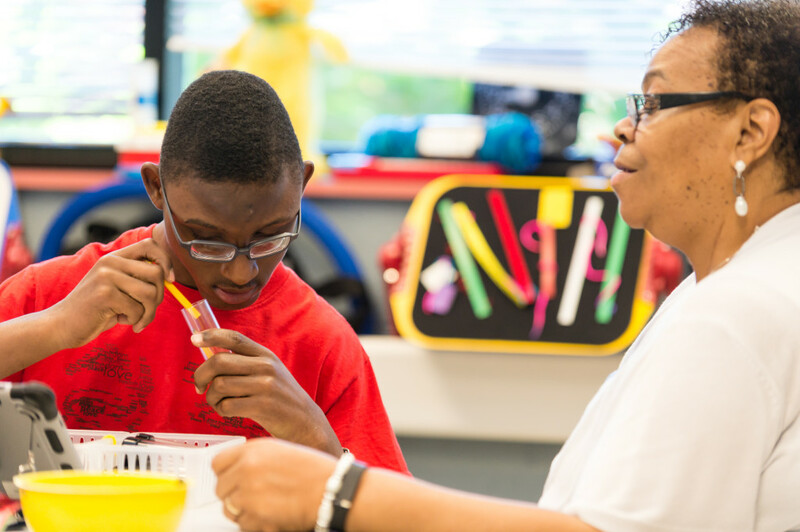 We serve students across Illinois school districts with a variety of educational needs and disabilities including vision loss, traumatic brain injury, autism, intellectual disabilities and multiple disabilities. This therapeutic day school provides one-on-one attention and a high staff-to-child ratio, offering the support needed for students to access the common core curriculum and develop capabilities for increased independence. Our program individually addresses each student’s educational needs. Individual Educational Plans (IEPs) are developed in collaboration with the local school district, staff, parents and students. These needs are determined by formal assessment scales and through evaluations by certified learning behavior specialists. Additional support is provided by speech language pathologists, physical therapists, occupational therapists, social workers, nurses, psychologists, orientation and mobility specialists, teachers of the visually impaired and teachers of the hearing impaired, as needed. In addition, students have access to clinical and rehabilitation services offered through our Low Vision Clinic. The CDC follows a year-round, state-approved calendar that includes an extended schedule during summer months.